Before we were The Mysts of Tyme we were The Assassins! We formed in the mid 60s and changed our name to The Mysts of Tyme shortly thereafter. Thanks to all who attended the Bobby Driver Benefit Concert Thursday night November 17, 2018 at the Plaza Theatre in Glasgow, Kentucky. Click here for some pictures from the concert snapped by Gayle Rigsby Steenbergen. This is the Top Song Pick on our website as of Thu, Apr 18, 2019, 8:00 PM, MDT. 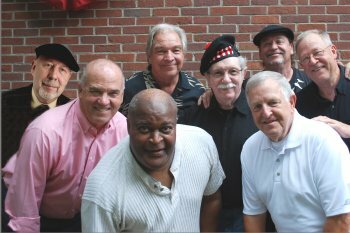 The Mysts of Tyme — maybe the oldest living garage band! We formed in the mid sixties while we were in junior high school. We remember sock hops after the football game, Elvis, The Beatles, car songs, surfing songs, soul music, The Stones, The Rascals, The Monkees, The McCoys, Chuck Berry and more! Look for our new CD (and look and look and look ). If you find one let us know! We've contemplated recording a CD for SONY records (in much the same way that you contemplate winning the lottery). So until then keep checking here and we'll let you know when we've saved up enough to get our CD made! Support live music! Hire a live band! Truth in advertising laws require us to tell you that we only perform music by people who are dead or are not feeling well. For your iPOD or MP3 player! Add our RSS News Feed to your RSS reader! Add our RSS Events Feed to your RSS reader!